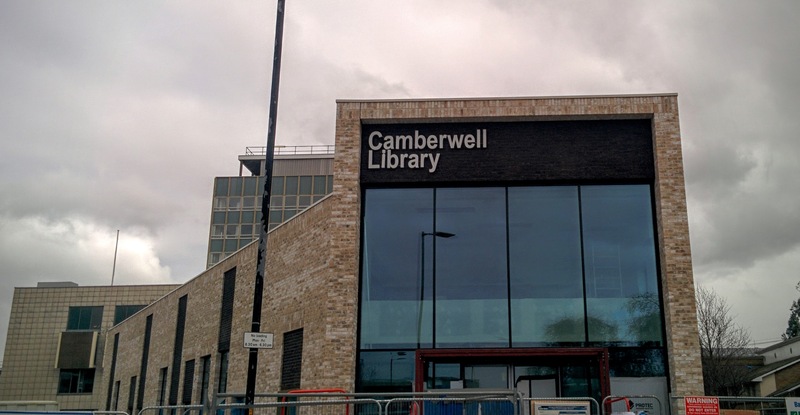 Some changes are coming to Camberwell Green from this month. The long‐awaited new library is set to open on the 4th November, somewhat delayed after unspecified ‘contractual issues’. The former library will close on 31st October, so there’ll be a few days without a library. But before that, work begins on the transformation of the Green. From 5th October until sometime next year the Green will be closed while the changes – part of a wider £11m regeneration of the area – are undertaken. The full plan [PDF] is available online, and you can compare old with new in the image below. The big change will be moving the playground from the East to the North side, enlarging it in the process. There will be feature walls around four major entrances, and a long wildflower meadow will be planted along the West edge (near Camberwell Road). The South will remain largely unchanged. Just outside the Green, there will be a new pedestrianised area on the North East corner by the new library, and the South East corner will also be pedestrianised and made into a permanent ‘market square’ — hopefully this will allow them to also serve cooked or ready foods. While the Green is closed, the market will move to Datchelor Place, outside the Pigeon Feed. Across Camberwell Road to the West, the new ‘Camberwell on the Green’ development has gone on sale. There are 96 new flats, with prices starting from an eye‐watering £446,000 for a one‐bedroom. On the ground floor of the development, on the East and South sides, there will be a number of new shopping units. All in all, there’s going to be a new look to the Green over the next year. As a minor postscript, Southwark have announced that all shop units in the new development, and existing units from the Green to the junction with Coldharbour Lane in the South, and to the Hermits in the East, have had change of use rights from A1 to A2 withdrawn. In a nutshell, that means they will not be allowed to change use to become “financial services such as banks and building societies, professional services (other than health and medical services) and including estate and employment agencies” — although they could still become pretty much anything else. Does anyone know what the old nail/beauty shop next to carravagio on camberwell church street is becoming? The whole place has been gutted and rebuilt so it looks like a serious refit. @geekinesis It will be the new restaurant from Mike & Ollie. Where do these figures for Camberwell Green come from and what do they include? Peter says £11 million. Southwark News says £13 million. The entire redevelopment of Burgess Park so far comes to about £8 million. The council must be bundling in every planned expenditure for the whole junction for the next decade and claiming it’s all for the benefit of the Green. I assumed that the main reason for restricting the permitted change of use was to stop more betting and money lending shops which I believe come under A2. @James J, you pointed out an error which I’ve now corrected — £11m is the whole central regeneration scheme, not just the Green. @Peter, Ah yes, I think making them sui generis must be have been a recent change to the planning regulations so that betting & money lending always need planning permission. I wonder why the council was so worried about Camberwell becoming inundated with banks and financial services — or perhaps they just don’t want more branches of Foxtons. Went along to Theo’s pizzeria on Saturday for their soft opening. The place looks great (lots of white paint and marble counters) and the pizzas were delicious. Quite a small menu with about 3 or 4 starters, 6 pizza options and 3 desserts, but that may be due to it being a soft opening. An excellent addition to Camberwell and we will be back soon. Another thumbs up here for Theo’s. Food was still half price last night, and was all delicious. Look forward to trying out Theo’s soon. 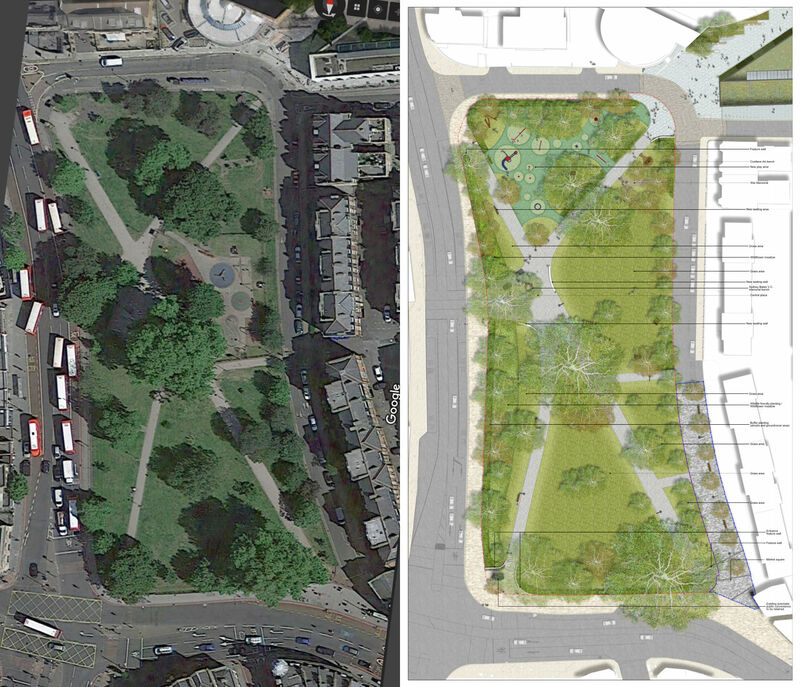 Am I going bonkers but the before and after of Camberwell Green look identical …amazing what you can do with millions of pounds. The overhead image probably doesn’t do it justice! There are a lot of changes, including moving the playground to the North end of the green. Overall I think the designs will make it a much nicer space to hang about in. I hope. @NickW — hope the ‘Beer Line’ afternoon was a success and you are getting closer to your fundraising target. Was attending my first away game for Dulwich Hamlet so couldn’t make it (4–1 win and up to 2nd). I did pop along to the Farmers’ Market on Saturday morning in its new temporary location in Datchelor Place. Even though it is still only 4 or 5 stalls it looks a lot better in the smaller space than out in the middle of the Green where I thought it often looked a bit sad with so few stalls. Completely agree about the market and you also have the benefit of the wonderful Pigeon Hole. Thank you for this posting, and this blog which I think is great. Out of interest, does anyone know why the farmers market is so small? Having seen the amazing variety of stalls at other markets in London, I’m sure a few more and varied stalls would be welcome, and there always seemed to be room on the green. Is it a decision by the council? Or due to upcoming changes on the green? When it first started it was quite large but as the weeks went by it got smaller and smaller because there is simply not a big enough demographic in the area who would go. Its not a decision by the council. If the stallholders could make money I’m sure they would be there but there are so many other markets with more customers. I don’t really like it on the Green if feels lost and markets should be thriving. Also some of the stallholders can be a bit grumpy.